Microalgae are typically produced in open ponds and closedphotobio-reactors. So far cost efficient open ponds are preferred when it comes to the production of high volume, low value biomass. However, the production rates and product quality may vary dramatically, areal requirements are high and algal biomass is more exposed to contamination. Photobioreactors (PBR) on the other hand allow a constant high performance under controlled conditions to obtain a defined quality.PBRs that are cost efficient, have low energy demands and stable enough to be used for high volume, low value biomass production are rare. 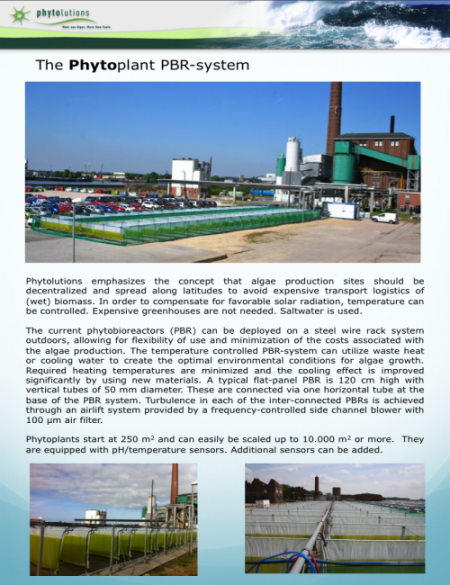 The aim of the R&D work was to create a bioreactor, which can be deployed outdoors, uses waste-heat for temperature control, has a clear positive carbon footprint and low installation costs on large scale (hectares to km2). Since January 2010, the Phytobag has been tested at installations of 500 m2 (25 m3) under varying environmental conditions at different industry sites. It was constantly tailored towards the demands from energy companies but has been further modified to serve the specific needs of the construction-, chemical-, feed-, food- and health care industries. 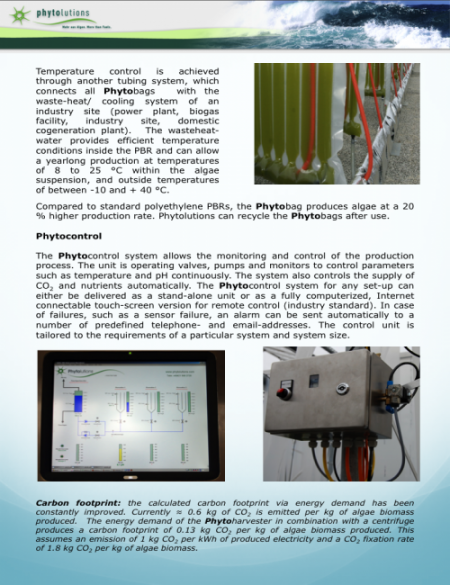 The Phytobag system allows an all-year outdoor algae production and can be connected to existing CO2 and nutrient sources. Thephytobags are available in a variety of sizes, from lab-scale to hectare-scale. CAPEX and OPEX have continuously been reduced. The strong endless-chamber phytobag is produced from multi-layer plastic, and can be individually tailored to meet specific customer needs. The micro bubble airlift system provides energy efficient ventilation of the plankton culture. Evaporation is reduced. The attached electronics allow to continuously control and monitor the production process. The internet excess allows immediate customers support if needed. The system controls the supply of CO2 and other media automatically. Additional sensors can be added and the control electronics can also be adapted to dewatering systems like our Phytoharvester. The feedflow concen-tration from the phytobag to the dewatering process is 2 – 5 times higher than from a typical open pond. Thus energy demands for dewatering are up to 20 times lower.